When I came by on an advanced scouting trip, as it were, looking for the perfect guest post for this site, I noticed that you frequently updated everyone on what you were watching, reading and listening to. So it dawned on me that there was perhaps no better way to introduce myself to your audience than by doing the same. I work an 11 hour day job for Sun Maid Growers of California where I supervise the packing of raisins and other dried fruits into various types of packaging materials. That doesn’t leave a lot of time for reading. However, of late I have managed to dust off my trusty Kindle and get some reading in. I read the new Dan Brown book, Inferno. I thought it was good and a worthy entry into the Robert Langdon series. The ending is a bit of a letdown, but all in all enjoyable for those who love those page-turning, cliff-hanging chapters of his. I then read the second book by Indie author Linda Cassidy Lewis. She’s a buddy and neighbor of mine who writes adult fiction about people and their relationships. I then read Richard J. Parker’s latest, Scare Me. I was blown out of the water by that one. If you like serial killer stuff, you have got to get your hands on that one. I’m stuck playing a little catch up in this category. You see my teenage sons don’t need dad to get them to the movies anymore. Now I see nothing until nearly a month later, and very often not until it’s On Demand on cable. *sigh* My wife and I did just see the latest in the Celine and Jesse series that is Before Midnight. We’ve really enjoyed these films and were very excited to get this third chapter. This one is a bit hard to watch because there’s a great deal of fighting, and not the kind of movie that enables you to skip the first one or two because you’ll end up not liking it at all. However, if you’ve enjoyed the first two chapters, I think you’ll like this one, too. My tastes vary, but lately I have been listening to a lot of Jamie Cullum and Thirty Seconds To Mars. We’ve got tickets to an upcoming Matchbox Twenty/Goo Goo Dolls show, so I’m catching up with the new Goo Goo Dolls cd. I’ve been very curious to hear the new Black Sabbath cd now that Ozzy is back, and the early reviews have been very favorable as far as I can tell. Paul Herrera finds himself bequeathed a mysterious old house near the California central coast by a deceased aunt he never knew. The woman who shows it to him is the spitting image of his wife, taken from him three years before in a senseless car accident which also took his unborn son. 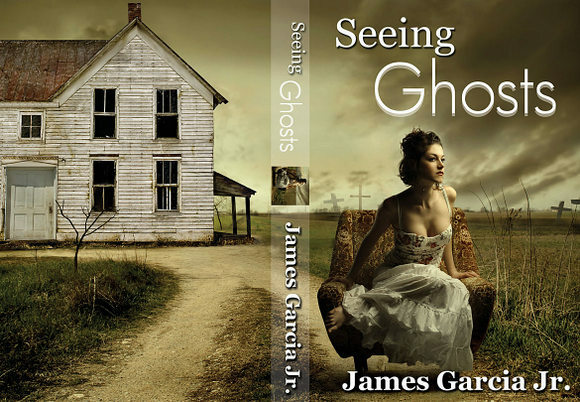 While he deals with the ghosts of a past he cannot let go, there are new ghosts Paul must deal with - alone for the week in the expansive two-story house that he will soon discover holds many secrets. Eventually, he will see that he is surrounded by ghosts as he struggles to hold onto the only thing that he has left in this world - his sanity. Also check out James' vampire novels Dance On Fire and Flash Point. Other author guest posts: Favorite sci-fi and fantasy movies by Alecia Stone, All you need is love by Kimberly Krey, How to write a character study? by Blair McDowell, Favorite Christmas stories by Robert Gray, Do we have past lives? by Sarah DiCello, Help an animal this Christmas by Stacey Joy Netzel, Omaha 1945 by Vickie Hall, Spooky Halloween treats by Kristina Springer, Favorite ghost stories by Jennifer Rainey and Five things you didn't know about Boris Karloff by Jolie du Pré. SEEING GHOSTS seems to be right up my alley. The cover alone makes me want to read this book! Looks great. That sounds like a great read! Hope I win! Thanks for the giveaway. I adore that cover, BTW. I love reading. And the book sound good. Can't wait to read it. I am a complete ghost junkie. Would love to read this book. I would love to have Seeing Ghosts! I am a huge ghost person and just love everything about them! Thank you for this amazing giveaway and the chance to win! Oh, I am *such* a sucker for stories like this :) ). "Ghosts"? LOL! I am *so* in. Thanks for letting me know about this story! My sister-in-law is a huge ghost lover and would really enjoy Seeing Ghosts as a gift. I want this book......can't find it anywhere and it looks like such a great book !! I think you should write your first 1000 word essay about this. People will like it!